Sri Lanka’s Kumar Sangakkara scored his 11th Test double century to move one behind Australia legend Don Bradman’s all-time record. He made 203 on day two of the second Test against New Zealand to help his side to 356 all out, a lead of 135. Sangakkara will quit one day international cricket after the World Cup, which starts in February. But the 37-year-old said he will “see whether there is a few more months of cricket in me Test-wise”. Sangakkara, who spent the majority of his Test career keeping wicket – claiming 178 catches and 20 stumpings before giving up the gloves – also became the fastest player to reach 12,000 Test runs on day one. “It just depends on how everything pans out after this World Cup,” added the former law student. Day two in Wellington ended with the Kiwis 22-0 in their second innings. 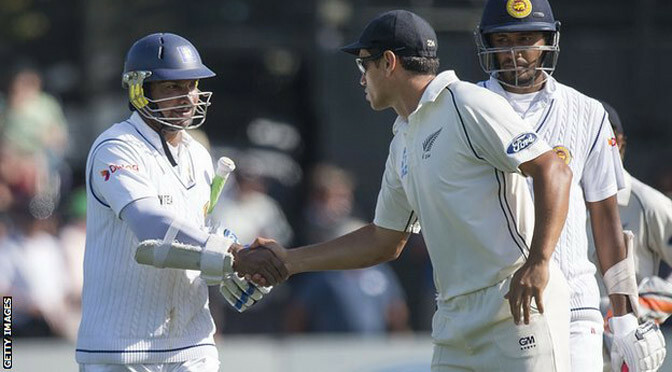 Sri Lanka need to win the Test to level the two-match series after aneight-wicket loss in Christchurch.